A series of fundraising events will take place in the coming weeks as the build-up continues to the eagerly awaited Breaffy Oskars. The Oskars will take place on Friday night, May 11, and will see some 70 locals star in scenes from very well-known films. A total of seven films are being shot including The Shawshank Redemption, The Field, The Snapper, and The Full Monty. Local actors are currently rehearsing for their films which will be recorded in the next two weeks and the gala red carpet premiere will be The Oskars, in Breaffy Resort Arena, on May 11. 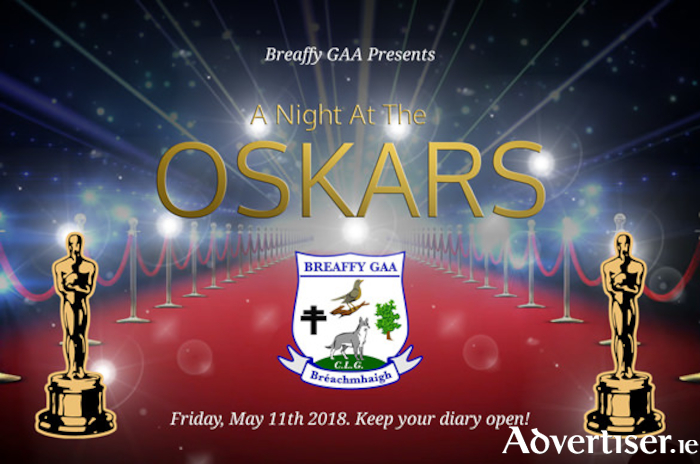 The Oskars is a fundraiser for Breaffy GAA Club facilities and all the teams from under sixes to senior, boys and girls, men’s and ladies clubs. Tickets are on sale now and can be got from anyone taking part, as well as from any member of the Breaffy GAA Executive. As part of the build-up, there will be a host of events before May 11. Tonight (Friday ) a table quiz will take place in the Punch Bowl, Ballyheane, starting at 8.30pm and there will be a 25 card drive in Breaffy GAA Clubhouse, starting at 9pm. Tomorrow (Saturday ) there will be a curry night in the Breaffy GAA Clubhouse immediately after the Breaffy v Claremorris division one league game. On Sunday, there will be a car boot sale at Ballyheane pitch, commencing at 8.30am. On Thursday, April 26 there will be a table quiz in Hogs Heaven, Castlebar, getting under way at 8.30pm. On Friday April 27 Breaffy GAA Clubhouse will play host to a ‘gintastic night’ and a Mr and Mrs competition. The night gets under way at 9pm. On Saturday, April 28, there will be a car wash at Breaffy GAA Clubhouse from 9am to 3pm. A coffee morning takes place in the clubhouse at the same time so you can have a cuppa and some cake while your car is washed. That evening there will be a barbecue at the clubhouse, starting at 8pm. A number of other big fundraising events will be taking place over the next few weeks, keep an eye on Breaffy GAA's Facebook page for more updates.